Sponsored by the Rotary Club of Lambertville/New Hope. 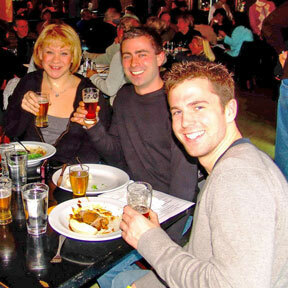 Beef and Brew is co-sponsored by Triumph Brewing Company of New Hope and the New Hope Lambertville Rotary Club. Triumph provides a spread of food and beer to surely fill you up! Hot roast beef, fresh rolls, mashed potatoes, vegetables! All of their craft beers will be included in your ticket price. Enjoy live music on stage from 1-4pm. Meet both local and out of town folks for a memorable afternoon! The Rotary Club also holds silent auctions and 50-50 lotteries. Silent auction items include guided local fishing trips (60 plus bass per night caught), stays at a beautiful cabin in the Poconos, boat trips on the SPLASH steamboat up the Delaware River, and train rides on the bucolic Black River and Western Railroad that runs between Flemington NJ and Lambertville NJ.